Media Ethics and Society: Beware: Astroturfing. Who Needs Ethics? It seems like just a few hours ago I was reading a tweet written by President Trump about fake news and the media and God knows what else. But look out fake news, there's a new unethical act on the rise and its name is Astroturfing! Now the public must look out for another thing as to not be manipulated. Ah, what a time to be alive. According to The Guardian astroturfing is, "The attempt to create an impression of widespread grassroots support for a policy, individual, or product, where little such support exists. Multiple online identities and fake pressure groups are used to mislead the public into believing that the position of the astroturfer is the commonly held view." Ever since the rise of online media, astroturfing has also increased. It frequently takes place on online forums and blogs where people can leave numerous comments under different names and most likely not be caught. Who is most responsible for this trend? Major companies and corporations. This trend has been on the rise ever since Twitter and blogging have allowed millions of people to assert their opinions openly and online. This opens the doors to many fake people and fake reviews, which is utterly unethical. This usually starts out by employees asking friends or family to write a biased and very positive review on their company. When that doesn't work, corporations take many drastic measures. They begin astroturfing to increase the amount of reviews and their ranking. So how is this done? According to an article on Computerworld they use a class of software called "persona management software." This "magnifies the effectiveness of each paid fake opinion writer by auto-generating a credible but phony online persona, including a fake name, email, address, web site, social media profiles and other data." Honestly, I think this is a whole lot of work, just to not have loyal customers. This type of behavior is not at all sustainable! Yes, by posting fake positive reviews and high ratings you might initially have a lot of customers. But, once they become dissatisfied consumers and no longer trust your fake reviews they will stop buying from you. Therefore, with a high amount of one-time customers and a low amount of loyal customers, the business will not grow nor succeed. Also, astroturfing can land the company in a lot of hot water. If they are caught they will face penalties and fines that can untimely take away the revenue they were bringing in with the fake reviews. According to Review Trackers astroturfing can be prosecuted under several variations under consumer protection laws put in place to protect consumers from false and deceitful advertising. In 2013, 19 local businesses were fined over $350,000 for generating false reviews on sites. Why even risk it? Then your business and your credibility are ruined. I also think that more companies need to be concerned about astroturfing. We cannot only rely on the government to take care of it because it is already so widespread. Because of this when looking at reviews and blogs people need to take into account whether the review is by a professional reviewer at a reputable company. Also, we need to make more people aware that the trend is actually happening. 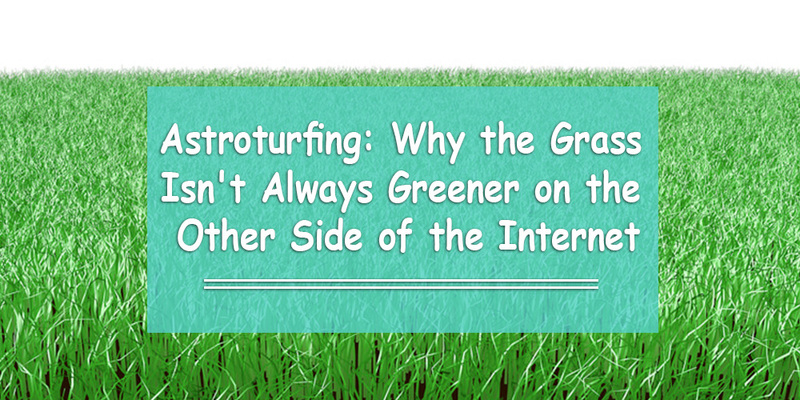 Many people have never heard of astroturfing and therefore, would not know to look out for it. The media should be shining a light on this problem because many people already do not trust them. People do not need to feel as if they are being farther manipulated. Therefore, this problem must be addressed and taken seriously.